One of the preventative measures that many homeowners fail to take that can cost them big bucks is winterizing their exposed pipes. When the temperature plunges below the freezing point of water, pipes in unheated portions of the house or outside the house can freeze and crack because the water inside them expands. Burst pipes cause expensive leaks that can cost a great deal of money for a plumber to fix, according to the American Red Cross. Even slow leaks inside the walls can result in mold damage. The problem needs to be addressed even if you live in the southern part of the country where it rarely freezes. One or two nights of extremely cold weather can result in lots of damage. What kinds of pipes are prone to freezing? Any pipe that is in an unheated or poorly insulated portion of the house, including attics, basements, and crawl spaces, is prone to bursting during cold weather. Also, any pipes that are on the exterior of the house, including swimming pool systems, sprinkler systems, and the portion of the pipe that extends from the below-ground line to the house, where typically you attach your garden hose, can freeze. How do you prevent freezing pipes? You can do a number of things to avoid freezing pipes. Wrap exposed pipes with insulation. Home improvement stores have pipe sleeves or pipe tape that work pretty well to prevent exposed pipes from freezing and bursting. Disconnect your garden hose. Drain it, and store it for the winter. Drain your pool, and cover it. Consider spending a few hundred dollars to access your between walls and crawlspace pipes, and make sure that they are well insulated. 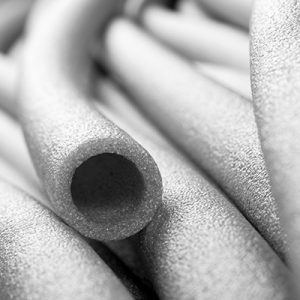 Popular Mechanics suggests that you use a product called a heating cable to keep the pipes warm during extreme weather. If, as is usually the case, your kitchen sink is against an exterior wall, open the cabinet doors during times of extreme weather. This will allow the warm air in the house to keep the pipes leading to the sink heated. If you are away from the house, even for a weekend, make sure it is well heated. Consider switching off the water. If you have other questions, a good plumber will be able to inspect your house and give advice on how to winterize your plumbing system.